So this is not really related to South Asia, but it kind of is, because these women have had a profound effect on shaping me for my time here. I was talking to some people the other day about how God has been very faithful and good to me in my travels - and placing these women in my life is one example of that. 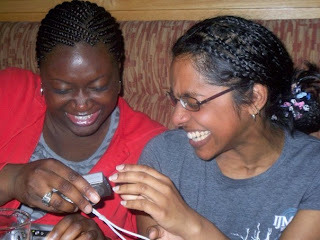 Bukola was my flatmate while I was in DC and Christine, Sharon, Oduwa and Shayla were our regular hang buddies. We also did small group together - Tim Keller's Fruits of the Spirit series. I appreciated their honesty and vulnerability, their ridiculously awesome sense of humour, their wisdom, and the way that they loved me so well. Love you ladies!